Maretron?s Alarm Module generates visual and audible alerts for any monitored condition. The Alarm Module includes an extremely loud 105 dB SPL Piezoelectric sounder, along with a red high-brightness LED to indicate an alarm condition. A second green LED incidates that the Alarm Module is powered and ready to be triggered. The audible alarm can sound any one of 32 distinct pre-programmed patterns to indicate different alerts. The Alarm Module can be triggered by alarms generated by Maretron?s N2KView Vessel Monitoring System, or by Maretron?s DSM250 Color Graphics Display. 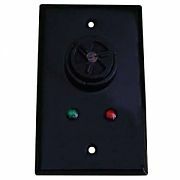 The Alarm Module mounts in a standard electric box or can be flush mounted on any surface. Completely waterproof, the Alarm Module can be mounted inside or outside the vessel. Best of all, the ALM100 is NMEA 2000® certified so you can install alarms anywhere on the vessel. The ALM100 is a key component of Maretron's N2KView® vessel monitoring and control system.